The haemorrhaging oil price is taking its toll on Scotland. It’s red sky in the morning for the North Sea today, with BP expected to announce several hundred job cuts to staff at its Aberdeen headquarters on the back of tumbling oil prices. 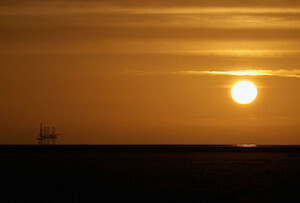 The oil major has around 4,000 North Sea staff, out of 15,000 in the UK and 83,900 worldwide. In December it announced a restructuring plan costing $1bn (£657bn) over five quarters, as Brent Crude oil fell from $110 a barrel in June to below $60. Since then, it has fallen below $46 and is currently around $47.50. BP had already been slimming down since the Deepwater Horizon oil spill in 2010, shedding more than $43bn of assets including half its pipelines, 35% of its wells and 12% of its reserves, according to the FT. But these latest cuts have been sped up in response to the bleeding of black gold. It doesn’t mean the petro giant’s production is going to screech to a halt: it’s in the middle of investing £10bn in the North Sea in the next three years, as it brings two giant new oil field on stream. In total it has ploughed £35bn into Scottish oil. But the expected cutbacks come after a number of other companies said they were cutting hundreds of jobs and contractor pay (and not just North Sea producers either - Africa specialist Tullow Oil said this morning it was writing $2.2bn off various assets). It’ll be awkward timing too, given UK energy secretary Ed Davey is due in Aberdeen for a meeting to discuss falling prices with oil execs. It’s even worse news for the Scottish nationalist government led by Nicola Sturgeon, who announced a task force was being set up to help the industry yesterday (got to be seen doing something…). Bank of England governor Mark Carney told MPs on Wednesday falling oil prices were a ‘negative shock’ for Scotland’s economy, but a ‘net positive’ for the UK. It’s not clear whether the red-tinged North Sea will seriously impact the SNP, which is currently on course to wipe out Labour in Scotland in the upcoming general election. But many Scots may well be thanking their stars they’re not independent right now. Could UK plc ever be powered by hydrogen? Will the oil giants be disrupted?